Donuts are the new chocolates. Yes. Really. 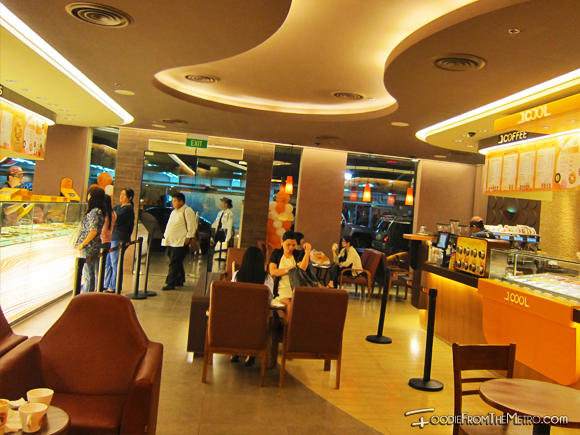 Last Monday, we dropped by JCo’s first Philippine branch in Megamall—days after its official opening since I wanted to avoid the the long lines and whatnot’s. 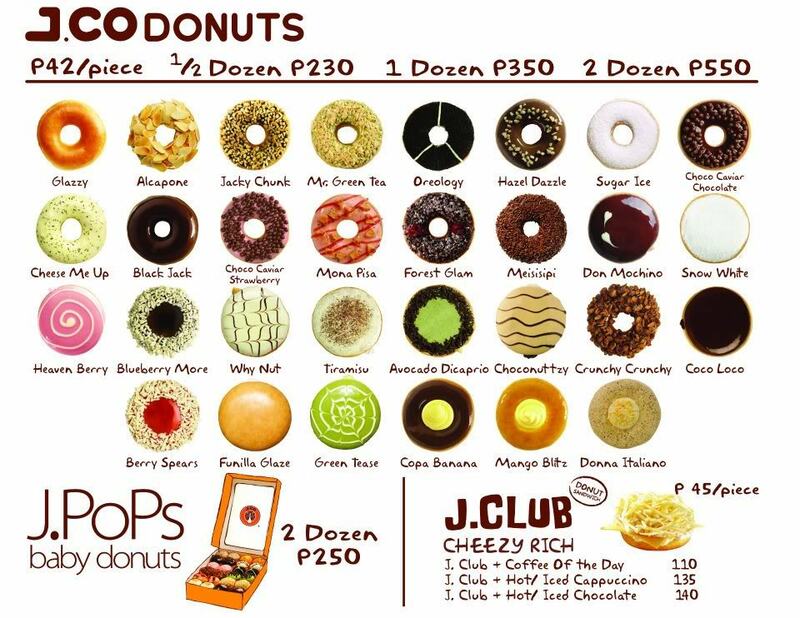 JCo Donuts is really hard to pass up because I’ve been hearing and seeing a LOT of buzz about this brand; naturally, I wanted to see if it is as good as everyone has been saying. 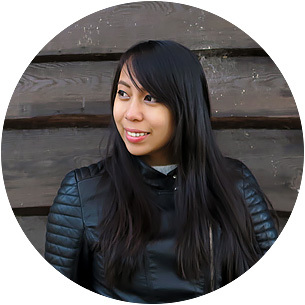 They were located at the The Strip – B and I was relieved to see that we wouldn’t have to suffer through a queue—still, the place at that time had a good number of people! 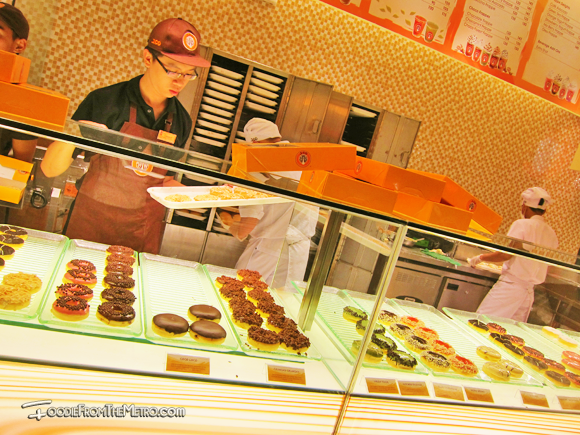 Now I expected JCo Donuts to be in warm earthy hues given their billboards and ad placements that are all in loud-screaming orange… and it was! BUT! I wasn’t expecting it to be such a spacious spot! With an al fresco area, you’ll have a sight to see because from the outer façade, you could witness the crew work their magic on the donuts! Inside, I felt like the place was made just for me because I’m all for warm and romantic lighting! Needless to say, I instantly fell in love with their ambiance. But the really noticeable thing here is on how they have two large counters on both sides of the room. On your right would be where the donuts are, but you could also order your drink or your yogurt from this section (but it’s best to go to the other side). They have a lot of items on their menu actually, and I’d be showing this at the last part of this post. 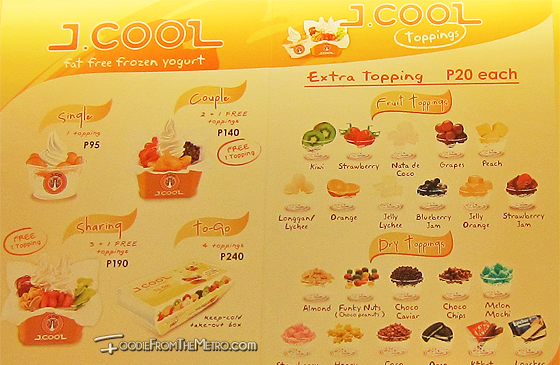 Meanwhile, on your left would be where their coffee, frappe, and yogurt (J.Cool) selections are. 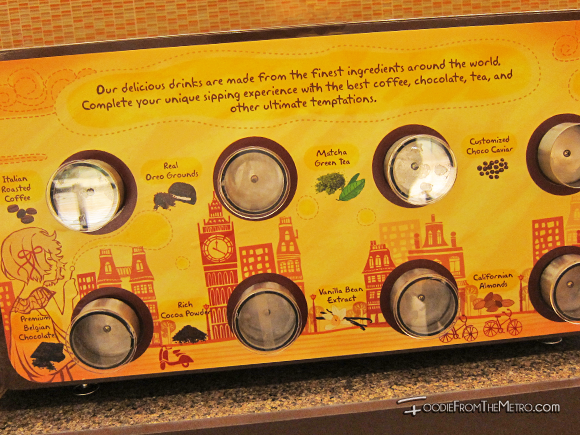 You can choose from their finest drink ingredients like matcha green tea, Californian almonds, Italian roasted coffee, among others. 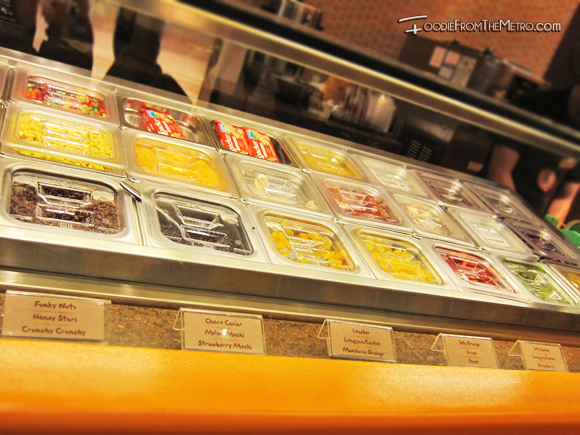 And also, there are fruit and dry toppings for your own kind of yogurt serving. 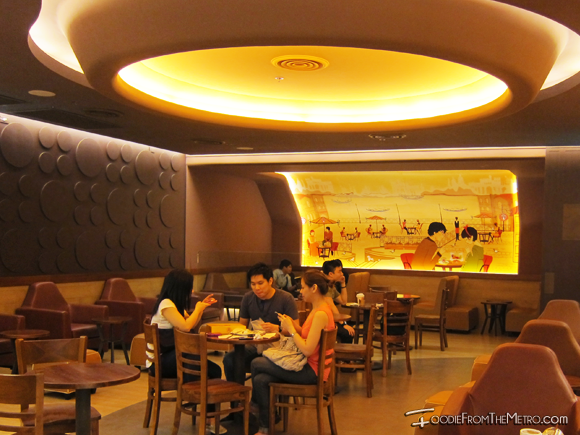 Other than this, they have ample chairs, couches, and tables; add the pop and chic cartoon scenery on the walls and it slowly bordered to being my ideal hang-out place. (This was a mural made by a local artist, Charlene Villamor). What’s more is that you could even have a peek to their innermost kitchen! 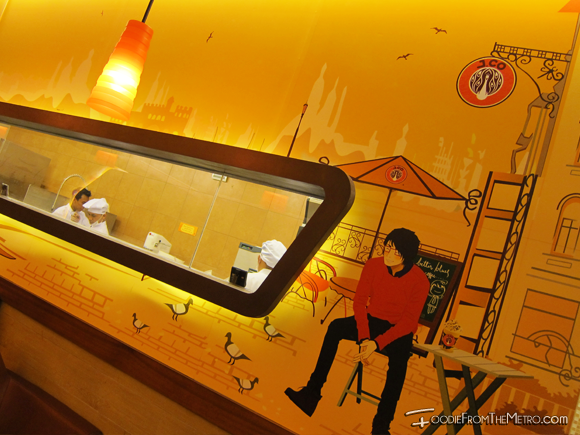 But of course, we weren’t there just to gawk at JCo Donuts’ inviting surroundings… we were there for their donuts! Of course we were! 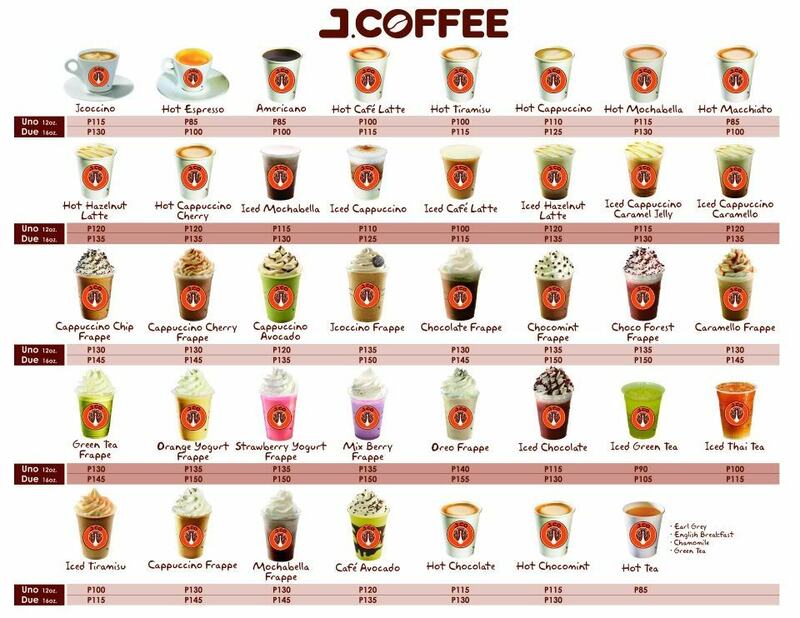 So, I asked one of their cheerful staff and I learned that they have more than 20 flavors, but for that time, there were 22 available ones. Upon hearing that… I was tempted so badly to purchase two dozen of their regular donuts! …But we weren’t really planning on killing ourselves just yet through excessive sugar intake. 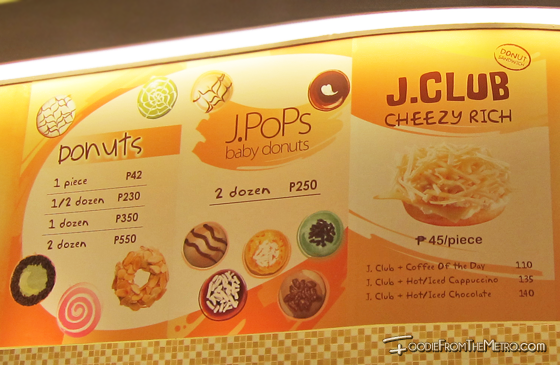 So good thing they have J.Pops which are bite-sized ‘baby donuts’! When she showed me a sample of what it would look like, the phrase “a box of chocolates” immediately registered to my mind. 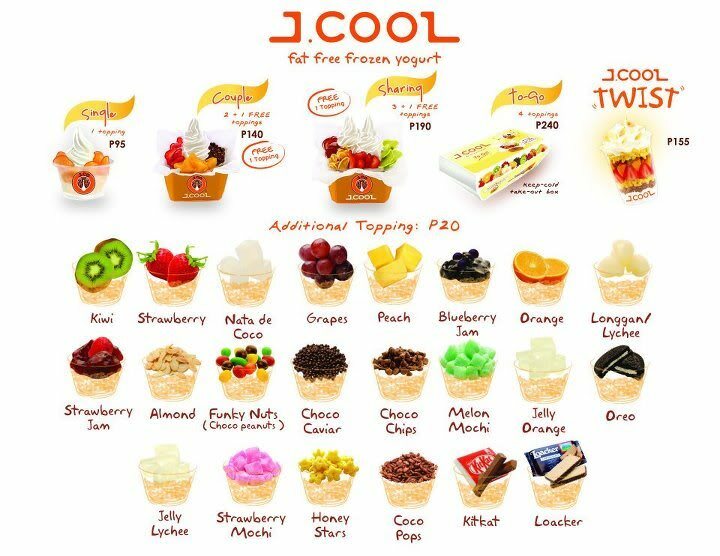 Without any hesitation at all, we bought two dozen of J.Pops for only P250.00! And this, ladies and gents’, is where the REAL gastronomical fun started… But actually, before I go on, let me ask you this first: have you watched “The Vow”? Because there was this one scene where Channing Tatum and Rachel McAdams took turns in sampling a box of assorted chocolates without really knowing the exact flavor of each of those pieces… Now if you remember this, then that’s exactly what we did! Except that I was with my sister so this was very, very, non-romantic. Haha! Fresh from the oven—let the fun begin!!! This is JCo Donuts’ signature soft bite donut topped with Belgian white chocolate and roasted slices of Californian almonds. This was very creamy and milky; no wonder that it’s an instant favorite! Peanut-buttery ganache with chocolate drizzles. If I had known that this was a nutty type, I wouldn’t have tried eating it. Haha! It’s just that I’m not a fan of peanut butter but this still tasted great! I was very excited to try this out, but when I took a bite, the avocado fruitness was very faint and the aftertaste had this strong tangy flavor that I’m not so sure of. Filled with cream cheese, this was topped with strawberry sauce and white chocolate topping. But with the color of the said sauce, at the start I thought it was orange sauce or something. Haha! Nonetheless, this was really rich and yummy. The only difference from the Berry Spears was that this had blueberry sauce. I loved biting on to this baby! Certainly this wasn’t caviar, but it looked like one. The ‘caviar’ were simply wafer-like munch-ons that adds a crisp in between each bite of this hazelnut-flavored choco donut. A fruity take compared to the Choco Caviar. Belgian chocolate filling and glaze; this was sinfully chocolatey as it could be! Made up of dark Belgium chocolate glaze and light cappuccino filling. Though this is different from Coco Loco, I can’t help but feel that they’re the same since the glaze and filling were light to the taste. Chocolate-covered donuts with crunchy chocolate rice crispies on top. This had a velvety filling and then coated with a creamy glaze that tasted much like coffee. Much like Black Forest types of cakes, this was topped with cherry, dark chocolate, and confectioner’s sugar. Honey-glazed soft bite donut that is said to melt in your mouth; by the time I reached this piece, it was already cold so I really didn’t get the chance to experience this ‘melt in the mouth’ thing. But even if it was cold, it was as soft and velvety as it can be. Macha Tea as its creamy topping and then drizzled with white chocolate sauce. What I liked about this is how there was a balanced strength of the taste of tea; because most of the sweet green tea products that I’ve been eating lately were either too milky or too bold. Hazelnut filling + Milk Chocolate Glaze + Chopped Peanuts = a recipe for a great chocolate treat! A strawberry cream donut topped with swirly white chocolate garnish; it looks simple but the taste could pack quite a fruity punch! A classic: full of chocolate topping, choco filling & chocolate sprinkles. I’m not into savory things when applied to sweet pastries but for Mona Pisa? I could make an exception! Specked with sausage bits, glaze, and tomato sauce, I can say that this was quite an unusual one but worthy-to-try nonetheless. Injected simply with creamy vanilla filling and basked with confectionary’s sugar. Simple?Yes. But rich to the taste? Defnitely! The perfect donut for Oreo lovers like me! Covered generously with ground bits of Dark Oreo and white chocolate topping, I’m surely going to buy this one on my next visit! Oooh… this was bliss! Really, it was. 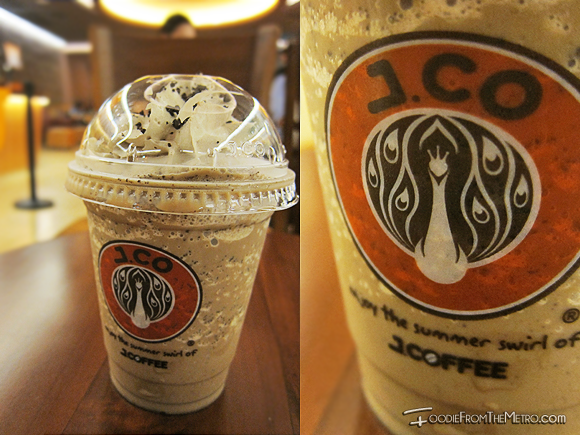 Injected with flavors of espresso and topped with cocoa-powder, it’s the perfect J.Co donut for coffee lovers out there. Another peanut-filled donut which I surprisingly didn’t mind! It tasted a bit like Reese’s chocolates. And oh, who wouldn’t love the decorated white and dark chocolate topping? Sugar Ice : it’s like Snow White but without the filling. The names are really cool! Haha! I’ve had my fair share of ‘sugar excess’ with brands like Krispy Kreme. Cello’s, for example, is one establishment that I haven’t been back to for years because I was really turned off from their donuts; two bites into one of their selections and I found myself so sick of it. Now back to JCo Donuts, if you take these treats out and freeze them up, once you’re ready to eat them, just leave them for only 8 seconds in the microwave and you’re set! And if you like your donuts cold, it’s fine because the soft texture remains. Sure enough some of their donuts weren’t too note-worthy but the overall delivery and taste? YUM. 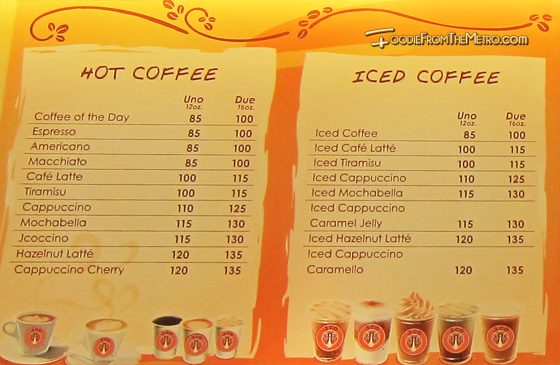 Of course, I wouldn’t leave JCo Donuts without even sampling one of their drinks. 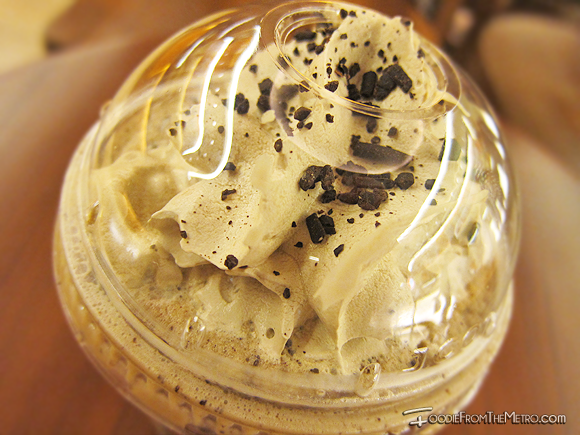 The staff recommended that I try their Cappucino Chip Frappe with Mocha Cream and boy, did I love it! It was the perfect pair for my donuts, though I realized that I should have gone for the hot types. Nonetheless, I’ll surely be back to try their other drinks because I’d want to try their Frappe Delights like Cafe Avocado and Orange Yogurt Frappe. 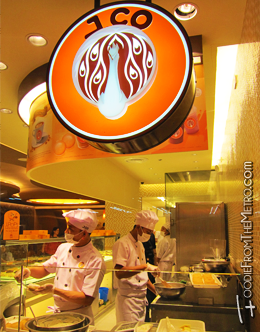 JCo Donuts and Coffee hails from Indonesia and had just started last June 2005; and yes, you can say that it’s an Asian version of Krispy Kreme—but better! They’re a premium lifestyle cafe that offers products made only from the best ingredients and they have branches all throughout Asia. (Indonesia, Malaysia, Singapore, and China). 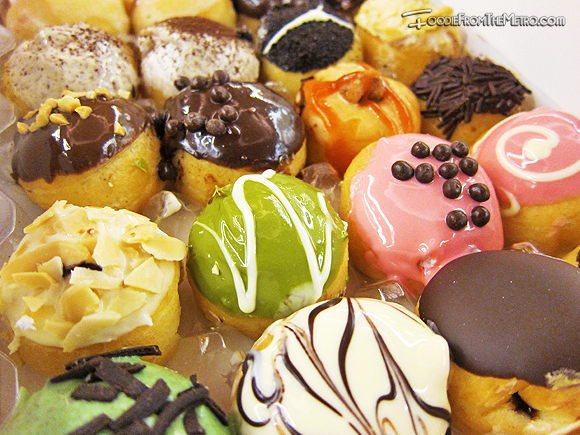 Do you LOVE JCo Donuts? Or do you hate it? 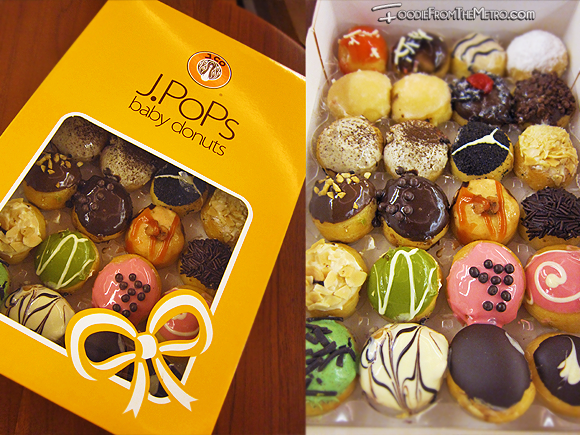 What do you love about JCo Donuts’ goodies?